If your caramel cools as you’re dipping the apples, gently rewarm it, adding a little more water if needed. Makes: Makes 6 caramel apples. 1Wash and dry the apples well, and insert a wood or paper stick into the stem end of each. 2Chop the bacon and cook it until crisp; remove with a slotted spoon to drain on paper towels, then crumble or roughly chop. Reserve 1 Tbsp. of the drippings and pour it into a small saucepan with the caramels and cream or water. Cook over medium-low heat until completely melted and smooth. 3Dip the apples into the caramel, turning to coat completely, then allow excess caramel to drip off and set on a parchment-lined sheet. 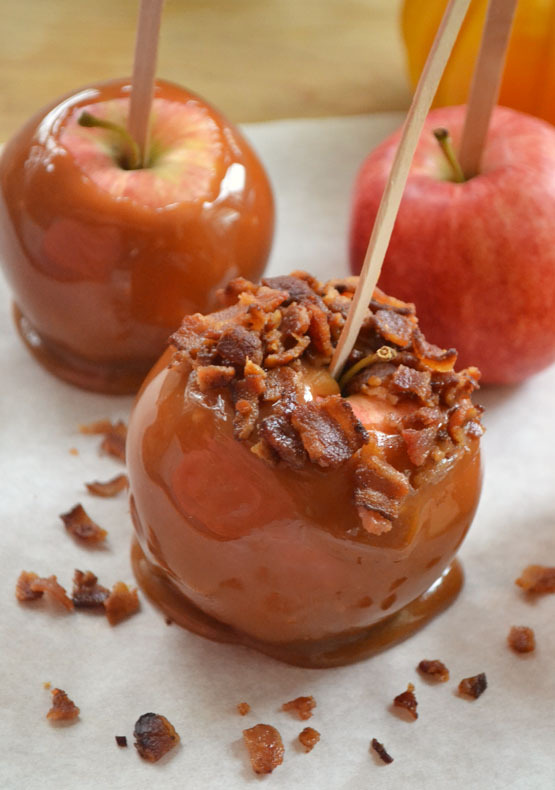 Sprinkle with bacon while the caramel is still soft, then let set.